The Bounds Copy of J.W. 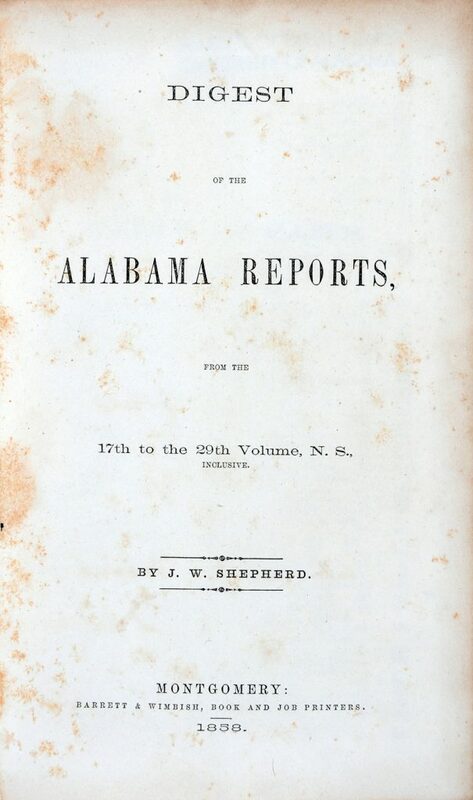 Shepherd’s Digest of the Alabama Reports from the 17th to the 29th Volume, N.S. [New Series]. Montgomery: Barrett & Wimbush, Book and Job Printers, 1858. Our “Preserved in Amber” series of posts seeks to celebrate unique and interesting objects, usually but not always a particular volume. The uniqueness typically comes from one striking feature—such as the correspondence between Hannis Taylor and J.B. Bury, pasted in Bounds’ copy of Taylor’s Science of Jurisprudence and featured in our October 12, 2016 post. To the law review spader or other casual user, there would be nothing particularly arresting about our Shepherd’s Digest. Further investigation, however, reveals a book that is interestingly signed and tantalizingly inscribed. Still more investigation reveals a mysterious blemish—quite unexpected. This latter, to be sure, was a feature that invoked this writer’s inner twelve-year-old, who arrived equipped with one of his favorite books. J.W. Shepherd, author of the Digest, was born in Madison County, Alabama, in 1826. He graduated from Yale College in 1844 and returned home to practice law. By 1851 he was practicing in Montgomery and was tapped as the reporter for the Alabama Supreme Court, a post he would fill (with various interruptions) until the early 1890s. 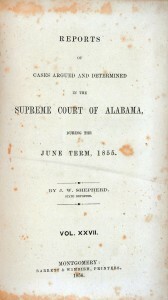 In line with regional publishing practices of the time, Shepherd published his 1858 Digest close to home, with Barrett & Wimbush of Montgomery. The Bounds copy of the Digest is inscribed with three names on the front pastedown leaf. The first, written in red pencil, is that of R.W. Walker. This signature could well be that of Richard Wilde Walker, who in 1859 would be appointed to fill a vacancy on the Alabama Supreme Court. Walker would go on to serve in the Confederate Provisional Congress and (1863-1865) in the Confederate Senate. In 1859, Walker sold the Digest to one Thomas Alan Jones, according to an inscription in Jones’ handwriting. At some point thereafter, Jones “presented” the Digest to James Irvine, quite likely the James Irvine who would represent Lauderdale County in the Alabama constitutional convention of 1865. The first indication that the Walker-Jones-Irvine Digest contains anything unusual can be found on the verso of the rear free flyleaf. There can be seen the remains of an inscription in pencil, almost wholly erased but beginning with the words “Preposterous Monstrosity” and ending with the words “to take it back.” It is written, apparently, in Walker’s hand; and its erasure probably represents nothing more than a courtesy from one owner to the next. Or was there something written that Walker or one of the book’s other owners didn’t want anyone to read? Unless we can stage a highly specific question-and-answer séance, we’ll probably never know. Moving toward an examination of the exterior text block, we see more proof that every printed book—mass-produced or otherwise—can become a unique object in the hands of its readers. Part of this Digest’s individuality is inked on the fore-edge of the text block in the form of a handy index. The categories are broad, certain to have been applicable to the practice of the period: Criminal, Probate, Chancery and Civil. Each of these words was accompanied by an arrow marking its extent in the text, and also by a number from 1 (opposite Criminal) to 4 (opposite Civil). The intent—purely practical—is far removed from that of fore-edge artists who have decorated books with symbolic, heraldic, or decorative images. Proceeding to the actual text of the Digest, we see that one reader (at least) has resorted to marking places with often rather emphatic dog-ears. These dog-ears are placed on or opposite to pages containing the following topics: Constitutional Law (p. 30); Court and Jury (p. 37); Pleading (p. 95); Statute of Limitations (p. 197); Assumpsit (p. 403); Evidence (pp. 626-627); and Execution (p. 630).Someone, in addition, drew (in ink) brackets around three sections of “The Trial of the Right of Property” (p. 761). 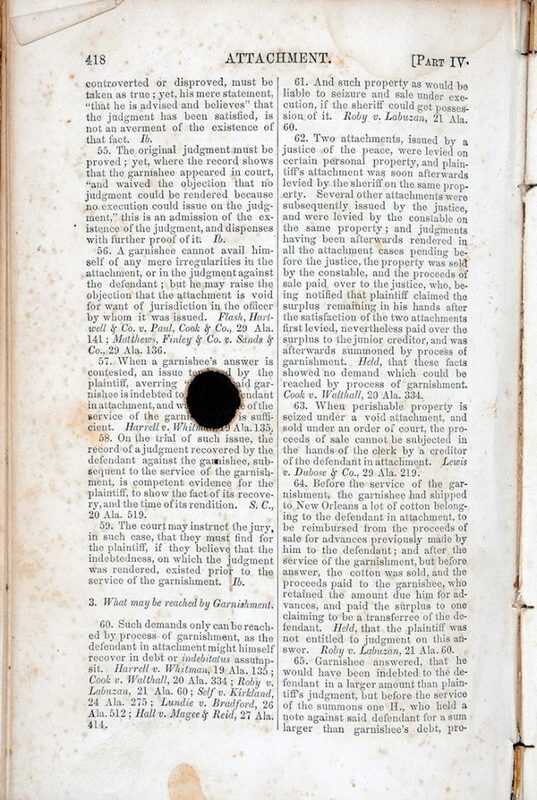 Aside from these indications of research interests, there are few ordinary alterations to this copy of the Digest; but the dog-ears and marks suggest that its owners pursued the ordinary practice of law. 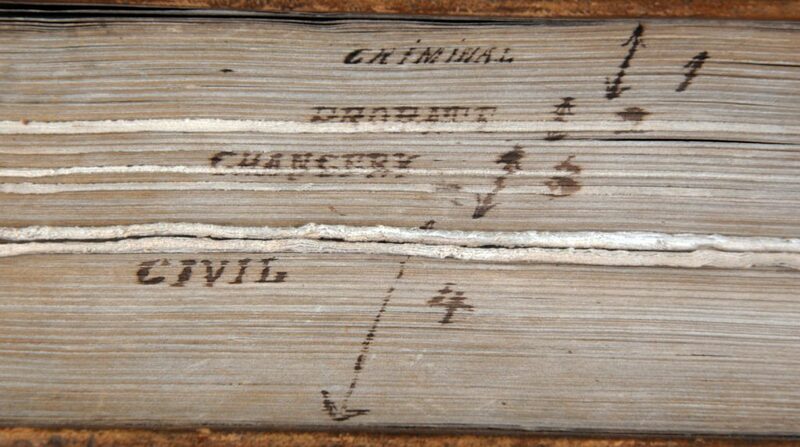 We encounter a much less ordinary set of marks beginning on p. 417. What presents itself, in the middle of §50 of the article on Attachment is a virtually circular mark 1.5 centimeters in diameter. It is a consistent dark brown in color; it has moved through the paper to produce an identical mark on p. 418. Each of these marks has stained its facing page (pp. 416, 419). The look of these dark marks suggests that they were burned—burned with considerable care, possibly by means of a fair-sized lit cigar. For all the world, they look strangely familiar, like something that resonates in memory. After a few days’ thought and very little (to be honest) further research, I am forced to admit that it is unlikely that our Digest ever fell into the hands of pirates, or even lawyers’ children pretending to be pirates. For one thing, its spot[s] do not conform to the rules laid down in Treasure Island. Pirates of that book’s Caribbean cut their black spots out of books, leaving one side unscorched. The unscorched side was supposed to be blank, so the pirates could write on it some cryptic sentence of doom. The Walker-Jones-Irvine spot, on the contrary, is burned on both sides, and there is no evidence that anyone ever took a knife to the volume. Moreover, the black spot made by firelight in Treasure Island (see above) still carried s few words of text—a spookily burned fragment of the Book of Revelations, namely: “Without are dogs and . . . murderers.”  The Bounds Digest also boasts darkened texts surrounding its double spot, but the texts are all about regulations for the attachment of property. One, for example, commences: “When a garnishee, against whom a judgm[ent has] been rendered by a justice [of the pea]ce, removes the case to the [unintelligible] [c]ourt . . .” To be sure, this passage once provided a revealing look into legal maneuvers that preceded the carting away of one’s possessions; but it is a bit lacking in dramatic pep. Finally, there are doubts concerning whether pirates ever used black spots at all. Perhaps, after all, it is better to argue that the Digest’s black spot[s] were caused by the carelessness of a smoker, piratical or otherwise, who thought he was putting his cigar down into an ashtray. Brewer, Alabama, Her History, 355-356. Owen, History of Alabama and Dictionary of Alabama Biography, III: 885. See Roy Stokes, A Bibliographical Companion (Lanham, MD: Scarecrow Press, 1989), 117-118. An alternate theory is that the spots were formed by the application of ink. This seems less likely because the marks on pp. 417-418 are each enclosed by a little halo of what appears to be scorched paper. And ink, unless applied by a deft hand, would quite possibly not have been so neat. Robert Louis Stevenson, Treasure Island (1883; Cambridge, UK: Cambridge University press, 2013), 22, 238. The latter possibility is still open to speculation, of course. This post features a “Lifetime” voter-registration certificate recently discovered in a local antiques mall. It is an attractive and oddly cheerful bit of ephemera from a tragic era in Alabama history–the time of mass disfranchisement by means of the state’s 1901 constitution. Pondering the significance of the certificate, only slightly larger than a 19th-century dollar bill, led to the following thoughts. In the late 1890s, after overcoming serious challenges to their power, Alabama Democratic politicians decided to take decisive action. They had used various illegal tactics—chiefly ballot-box stuffing—to defeat “fusionist” coalitions of agrarians, Populists, and Republicans. They had won the elections; they remained in power. But in the process their exercise of power had lost any claim to a basis in morality. In order to prevent future challenges (and to shield themselves from the temptation to cheat), they decided to follow a plan first carried out in Mississippi in 1890 and since perfected in other southern states. The plan’s chief feature was the adoption of a new constitution, one whose voter registration provisions would disfranchise large numbers of citizens. African American voters were the primary targets; but significant numbers of hill country white voters were likewise vulnerable. The Democrats justified disfranchisement on the grounds that it would “purify” politics by eliminating unworthy voters—surely one of our most striking examples of blaming the victims. If any further excuse were needed, the Democrats, especially the “Bourbons” of Alabama’s Black Belt counties, claimed that a new constitution would maintain “White Supremacy.” This last argument, it should be noted, was exactly how they had justified ballot box stuffing. After one or two false starts, the disfranchisers engineered a constitutional convention to meet in Montgomery in the late summer of 1901. The disfranchisers didn’t shy away from making their chief motives crystal-clear. Consider the following quotes taken from convention president John B. Knox’s opening address. The Democratic majority at the 1901 convention proceeded to adopt two voter registration plans, a “temporary plan” in effect through December 20, 1902, and a “permanent” plan to be used from January 1903 on. Under the Temporary Plan, registration was to be carried out by three-man county boards of registrars, each to be chosen by the governor, acting with the commissioner of agriculture and the state auditor (Art. 8, §186). See the image of one such certificate, issued to D. Pierson, of Reform Beat, Pickens County, on May 6, 1902. –be the owner of 40 acres of land or other property valued at $300 or more, on which the taxes have been paid (with exemptions for men whose wives meet the property requirement). Under Art. 8, §183, no person could vote in a primary election without being officially registered to vote. The ratification election for the 1901 Constitution was held on November 11, 1901. The official vote was 108,613 (in favor) to 81,734 (against). Twelve Black Belt counties voted in favor of the constitution by a vote of 36,224 to 5,471. The “vote in the other fifty-four counties of the state was 76,263 against to 72,389 for the constitution.” See Malcolm C. McMillan, Constitutional Development in Alabama (Chapel Hill, NC: James Sprunt Studies, 1955), 350. McMillan also notes a report (Mobile Register, November 13, 1901) that the Black Belt counties were slow in reporting their votes—an old tactic by which Black Belt political bosses could determine how many votes they “needed” to count. Thus on the face of the official returns, we are expected to believe that a considerable majority of African American voters voted to disfranchise themselves. In the years following adoption, African American voting almost vanished and white voting declined. The late Sheldon Hackney calculated that 35 per cent of potential white voters were “disfranchised by the poll tax alone.” He concluded ironically that “The convention had done its job well.” See Hackney, Populism to Progressivism in Alabama (Princeton, NJ: Princeton University Press, 1969), 208. Glenn Feldman, The Disfranchisement Myth: Poor Whites and Suffrage Restriction in Alabama (Athens, Georgia: University of Georgia Press, 2004). R. Volney Riser, Defying Disfranchisement: Black Voting Rights Activism in the Jim Crow South, 1890-1908 (Baton Rouge: Louisiana State University Press, 2010). William Warren Rogers, The One-Gallused Rebellion: Agrarianism in Alabama, 1865-1896 (Baton Rouge: Louisiana State University Press, 1970; subsequent edition, University of Alabama Press, 2001). William Warren Rogers, et al., Alabama: The History of a Deep South State (Tuscaloosa, University of Alabama Press, 1994; subsequent edition, 2010). Bailey Thomson, ed., A Century of Controversy: Constitutional Reform in Alabama (Tuscaloosa: University of Alabama Press, 2002). Samuel Webb, Two-Party Politics in the One-Party South: Alabama’s Hill Country, 1874-1920 (Tuscaloosa: University of Alabama Press, 1997). For the next offering in our series titled “Preserved in Amber,” we feature a post by U.A. law student Hudson Cheshire on our Hannis Taylor collection. 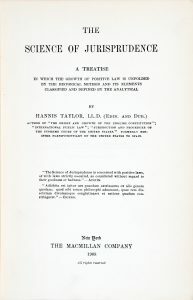 This collection consists of a copy of Taylor’s 1908 treatise The Science of Jurisprudence with two of his letters affixed to the endsheets. The letters are addressed to Cambridge history professor J.B. Bury. They seem blatantly self-promotional, but Cheshire demonstrates that they are also poignant and suggestive documents—items that transform this copy of a long-forgotten book into a unique archival object. Taylor (1851-1922) was a politician, lawyer, and prolific author associated with Mobile and Washington, D.C. We at Litera Scripta have long regarded him as an interesting and collectible writer (the subject, also, of a well-constructed biography). In any physical book there are multiple stories at work. Of course, there is the text itself: the words and sentences and paragraphs through which the author communicates his ideas. But in addition to the text, the history surrounding the text also tells a story. One might think of Harper Lee’s childhood in conjunction with her novel, To Kill a Mockingbird. But every text is also influenced by other texts. Doubtless, Go Set a Watchman changed the way most readers see the stoic, justice-seeking attorney, Atticus Finch. Finally, the physical object of a book also tells a story: with time, any physical book may be dog-eared, annotated, or otherwise marked by its readers. Through these physical traces we are given glimpses of another story still. Perhaps the greatest allure of opening an old book is the chance to observe all of these different stories as they intersect and intertwine. 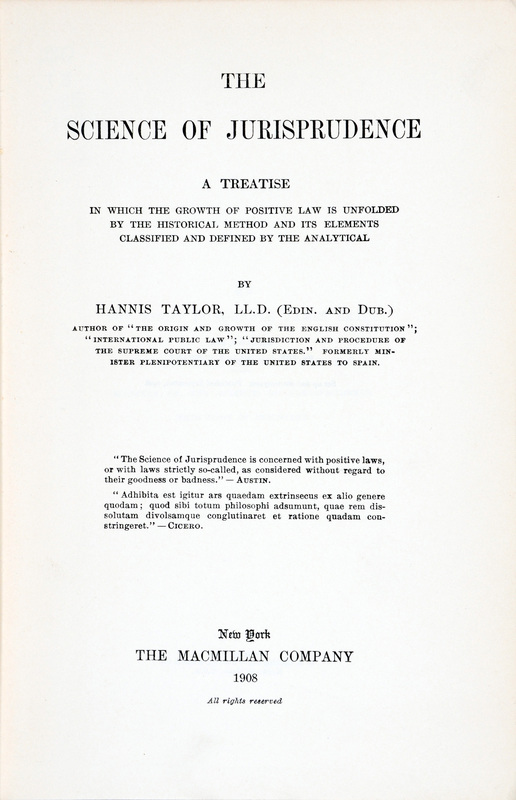 The subject of this blog post is a 108-year-old copy of a little-known book: The Science of Jurisprudence, by Hannis Taylor. The book is noteworthy in its own right as the work of a once important Alabama resident advancing a unique theory about American history. The library’s particular copy of the book is interesting for what are pasted onto its end sheets: two shamelessly self-promotional letters from the author to a professor overseas. Perhaps the most interesting aspect of the collection, however, is what happened only months after the letters were penned. To say the least, there are many different stories buried in this particular old book. Perhaps the best place to begin is with the book’s author: Hannis Taylor. Though nearly forgotten in contemporary scholarship, Taylor was an important figure in his own time, not only for his published writings, but also for his influence as both a lawyer and political figure. This post represents the second installment in a new category that we hope will be an occasional feature of our blog. Posts in this category will feature materials that are unique in some way, perhaps through ownership, creative attachment or insertion of documents, or other unusual items. Our previous post, “Next to His Bible”: John Randolph Griffin’s copy of the Louisiana Civil Code was the inspiration for this category that we have titled, Preserved in Amber. Our current post features an interesting small collection that is described by Hudson Cheshire, a 2017 J.D. candidate at the University of Alabama School of Law. The topic of this post is a recently acquired collection that offers a glimpse into the life of a small town politician in early 20th century Alabama. 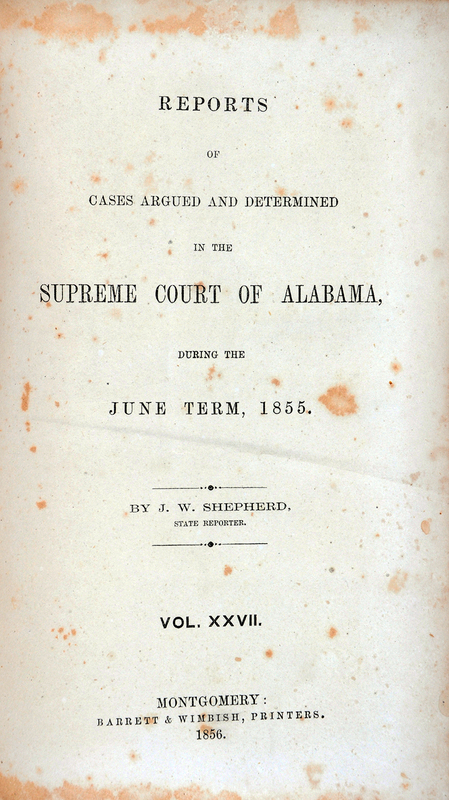 The collection includes a copy of Alabama Reports Volume XXVII (the Alabama Supreme Court cases argued in the June term of 1855), and three documents that were laid within its pages. Two of the documents are laundry receipts for one Samuel Blackwell. 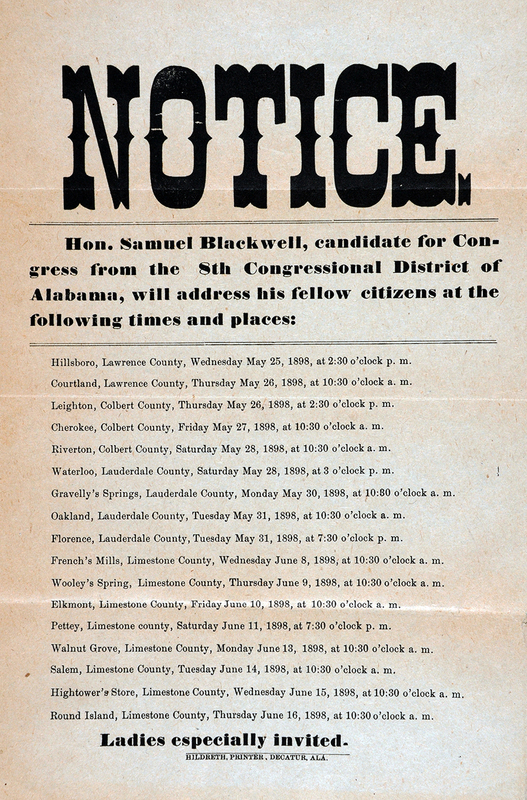 The third is a notice for a series of events where Blackwell would be speaking in his 1898 campaign for Congress. Samuel Blackwell, the subject of the laundry receipts and political flyer, lived from 1848 to 1918 and is buried in the Decatur City Cemetery. While history has relegated Blackwell to obscurity, the sparse documents that remain suggest a man of relative political success in his place and time. Blackwell began his career in public service early, enlisting in the Confederate Army at fourteen years old. By his fifteenth birthday, he was a prisoner of war in Camp Douglass, a large Union prisoner camp in Chicago. Years later, as the Morgan County delegate for the Constitutional Convention of 1901, Blackwell recounted a comrade’s sardonic description of the conditions at Camp Douglass: “We slept until after breakfast, skipped dinner, and went to bed before supper.” [Journal of the Proceedings of the Constitutional Convention of the State of Alabama, 1901, 3025]. 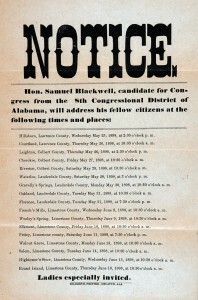 A document from 1903 indicates that Blackwell served at least one term as mayor of New Decatur in the early twentieth century and in the 1910-1912 Biennial Report of the Attorney General of Alabama, Samuel Blackwell is listed as the Solicitor for the Morgan County Law and Equity Court. Perhaps the only lasting glimpse into Blackwell’s perspective comes from his words at the 1901 Constitutional Convention, preserved in the Official Proceedings. Describing the Convention’s atmosphere of pessimism regarding the voting capacity of the general population, historian Sheldon Hackney quotes Blackwell saying, “nature has marked the weak and incompetent to be protected by Government, rather than to be the directors of the Government.” [Populism to Progressivism in Alabama, 196]. Had Blackwell been successful in his 1898 campaign for Congress, he would have been better remembered in Alabama history. Nevertheless, available records merit the assumption that Blackwell was an influential political figure at the turn of the century, if only in his own small corner of the world.